The new team heading the European Commission in Brussels is lucky. Its predecessors closed two sensitive deals before the reshuffle: a European energy and climate strategy for 2030 and a gas winter package between Ukraine and Russia. On top of that, outgoing Energy Commissioner Günther Oettinger finished off a thick report on the way forward for a European energy market. The new Commission will follow up on these three dossiers, plus two more dreamt up by its new chief Jean-Claude Juncker: the so-called Energy Union and a €300 billion investment package. Energy union: what’s up, doc? The new Commission President has come with a mascot, a toy, something in the air that he caught and used to show how forward-looking he is: an Energy Union. The term first appeared in the mouth of former Commission President Jacques Delors and was then hijacked by Polish Prime Minister Donald Tusk to present his vision for a European energy policy taking care of coal and reducing its dependence on Russian gas. Today the concept is still to be defined. And that’s the trick: European lobbies and institutions have high expectations for European energy policy, but they may well be disappointed by an Energy Union that is more a cosmetic exercise than real progress. “We have a hashtag #EnergyUnion, that shows how much we are serious about it,” Vice-President Maroš Šefčovič [say “ma-rosh shef-cho-veetsh”] said at his first big Commission conference on energy in Brussels on 17 November. Yes, it sounds like a joke – and it may be one. The story started with the re-organisation of top management at the European Commission: seven Vice-Presidents each “steering and co-ordinating” a team of several Commissioners. Each of the 20 Commissioners can belong to one or several teams. One of the teams is for the Energy Union and its members are the Commissioners for Climate and Energy, Environment, Transport, Research, Agriculture, Regional Policy and Internal Market. But the first meeting of the team also included Digital Society, Competition, Trade and International Cooperation. On top of which, it will have to coordinate with the High Representative for Foreign Affairs on international aspects. In Brussels, everyone is perplexed on what all this will deliver. But the biggest issue is not the decision-making procedure or even what form it will take. It is content. And there, Commission Director Klaus-Dieter Borchardt revealed what everybody fears: there won’t be anything new in comparison to what we have so far. In other words, it will be a mere repackaging of the bits and pieces of existing EU energy policy strategy: the EU treaties, last June’s security of supply strategy, the third energy market package, European Council conclusions, the 2030 energy and climate package, etc. Campaigner Mark Johnston, adviser at the European Policy Centre, said in a blog post that even the number of goals, pillars, principles and targets is confusing. Šefčovič has a plan in five points: security, solidarity and trust; the internal energy market; modulation of demand; decarbonisation of the energy mix; and research and technology. On top of that, he wants the EU to “explore further” the possibility of a common gas purchasing platform. He insisted on it again on 17 November, despite his Director Klaus-Dieter Borchardt saying earlier this month that this is “a non-issue” at the Commission for the moment. The Commission’s competition services have examined its possibility and concluded that in no way could the platform be mandatory. Thus it could only be run on a voluntary basis. “But does the market want it?” asked Borchardt. Well, it seems that the gas industry is not keen to pursue this option, according to the speech of Margot Loudon from Eurogas at the energy conference on 17 November. Fair enough, the trade association also includes a Russian member, the Russian Gas Society. 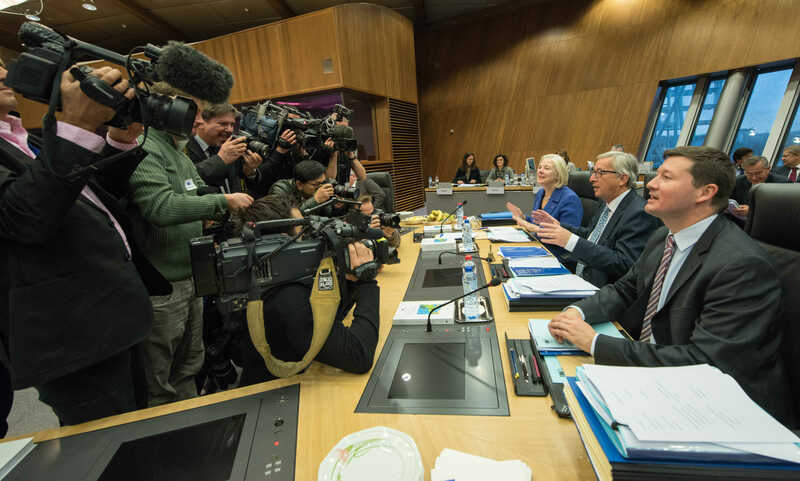 To further complicate matters, while all the energy lobbies in Brussels are preparing their contribution to the Energy Union debate, other voices are also piping up at the Commission. Marie Donnelly, Director for the energy transition at the Commission, has proposed to make an energy union focused on demand, not supply – an idea that brings some fresh thinking to this project. Šefčovič wants to present a plan in the first quarter of 2015 and in any case, the incoming Latvian Presidency of the EU wants something on paper by June and has made it a priority. This means that we can also expect debates on the matter within the Council of EU Ministers and other European institutions such as the European Parliament, the Committee of Regions and the European Economic and Social Committee. But so far no one is speaking of reviewing the delicate balance of powers between the EU and its Member States as far as energy is concerned. Energy policy is a shared competence. The pillar “trust” from Šefčovič’s plan includes Member States informing each other about their energy plans, but no more. The word “union” is much, much stronger than that, but nothing seems to suggest that we can expect Member States to give up any sovereignty over their energy mix, which would go much further to making this whole exercise more than cosmetic. The new Commission president came up with a bright idea to win the European Parliament’s approval last July: an investment package worth €300 billion. So far, we have little idea where the money will come from and even less where it will go to. But the suspense won’t last very long, because Santa Claus dressed up as Jean-Claude Juncker has promised that it will be unveiled at the next European Summit on 18-19 December in Brussels. In the run up to that date, everybody is fighting for a slice of pie. So far some 20 EU commissioners are preparing their “contributions” for the list of beneficiaries. Juncker wants to focus on infrastructure, notably broadband and energy networks as well as transport infrastructure in industrial centres; education, youth employment, research and innovation; and renewable energy and energy efficiency. Juncker has appointed Jyrki Katainen, his Vice-President for Jobs, Growth, Investment and Competitiveness, to lead preparation of the investment package. So the money is not destined for energy infrastructure and energy efficiency alone, as one may think when listening only to energy stakeholders. Energy infrastructure may not get a big slice anyway, because the investment package has to bear fruits within the next three years, and traditionally, infrastructure projects take longer. However, a handful of mature projects could get their fare share of the cake. Dominique Ristori, Director General for Energy, has said he wants funds for building renovations. He may well be heard as the sector provides for quick results and local jobs. What is certain is that the €300 billion will not come from existing budget categories. These were decided well ahead of Juncker’s appointment, in the framework of the EU budget for 2014-2020. This won’t be revised until 2016. Part of the package will come from a lift in the European Investment Bank’s (EIB) stock, to raise the bank’s lending capacity in the Eurozone. Another source could be pilot projects run by the EIB and the Commission called “innovative financing”, aimed at bridging the gap between risky, forward-looking projects and investors. This investment package is in any case much more than a Christmas gift to a depressed Europe: it aims to re-launch investment in Europe and shake European governments into action of their own. A last chance for Europe, Juncker acknowledged. Former EU Energy Commissioner Guenther Oettinger still managed to broker a deal on winter gas supplies from Russia at the end of October, just before changing jobs to become the EU’s new Digital Society Commissioner. Luckily, the Commission’s new Vice-President for the Energy Union Maroš Šefčovič was already at that negotiating table, just in case. Even if the first commitments of that deal have been fulfilled by both Ukraine and Russia, nobody knows how the situation on Ukraine’s eastern border will influence the fulfilment of further commitments. According to Tom Casier from the University of Kent and Academic Director at the Brussels School of International Studies, the most rational scenario would be, for Russia not to add fuel to the fire and avoid further complications in its relationship with Europe. Russia has a strong interest in continuing to sell its gas to Europe, he says, given its high vulnerability to European demand and its current economic situation, worsened by low oil prices and European sanctions. “But that’s only the rational scenario,” Casier says. The researcher points too to Putin’s strategy of surprise and even denial of reality. The Russian president has set himself up as a powerful leader, says Casier, and he cannot step back. The Stockholm Court’s arbitration may also influence the attitude of Russia towards Ukraine. And the latter could always siphon off some Russian gas sold to Europe if it runs short during the winter. One can add to all this the time bomb of the supply of eastern Ukraine by national utility Naftogaz: the separatist regions don’t pay for their gas but, unlike Crimea, they are still part of Ukraine, so they have to be supplied like any other part of Ukraine. “This issue was not part of the deal reached in Brussels,” a Commission official told Energy Post. “As Naftogaz, my duty should be to cut the supply to these regions,” its CEO Andryi Kobolyev told Energy Post. “But the Ukrainian government has decided not do so. They are discussing the issue.” He acknowledged that the gas deal reached with Russian on the so-called winter package “is probably of a temporary and fragile nature” and he invited EU experts to check the gas transport meters at Ukraine’s borders. Earlier in Brussels, Kobolyev had confirmed that Naftogaz would make maximum use of alternatives to Russian gas, including national gas, reverse-flow gas from Europe and stored gas, buying Russian gas “only to reach peak demand if it’s very cold”. Energy Post will return to the issue of Europe’s security of supply and in particular of the gas stress tests results – opportunely published by the European Commission before the last rounds of negotiation between Russia and Ukraine – in the months ahead. The stress tests concluded that Europe would be able to handle a complete gas disruption from either Ukraine or Russia. It would entail a “substantial impact on the EU”, especially in eastern and south-eastern European countries, but the impact could be mitigated for protected consumers “if all countries cooperate with each other”. The Russia-Ukraine conflict has thrown on a spotlight on the vulnerability European gas supplies. A recent study by the European Parliament however, argues that the economic argument should prevail in EU-Russia’s relations: “A general disruption of Russian gas flow would be a major blow to the EU and Russian economies alike,” it points out. Despite Russian politicians “being ready to pay the price” of this crisis with Europe, as Andrei Belyi said in a recent interview with Energy Post, “ a seven-month embargo would cost Russia €31bn,” the study estimates. “Be that as it may, alternative gas supplies will come at a cost to the EU economy, and run the risk of deepening the current recession in many EU Member States with a supply-side shock. Thanks to massive investments and to the spare capacity of the pipeline network, Russian gas is – and will long continue to be – more convenient in economic and environmental terms than other energy sources,” the study concludes. Cañete’s services are already busy with the EU ETS reform. First, they want MEPs and Member States to agree a Market Stability Reserve (MSR), a tool that aims to cut back the huge surplus of carbon allowances in the carbon market today. Initially foreseen to start in 2021, more and more voices now advocate an earlier date of 2017. And some want it to include right from the start the 900 million allowances that are being “backloaded”, or temporarily delayed from entering the market due to the existing surplus, from 2014-16. Cañete hopes for an agreement on the MSR by spring next year, although in practice the negotiations may well drag on for longer. Once the MSR is agreed, the Commission plans to “swiftly” table a broader reform of the EU ETS. On 11 November, Cañete also said he intends “to improve the conditions for the deployment of Carbon Capture and Storage (CCS)”, without giving further details. Thanks to the October summit, climate officials at the European Commission have a clear mandate for their work towards a new global climate treaty in Paris in December 2015, too. The EU is proposing a 40% emission reduction relative to 1990 levels by 2030 (see here the US and China proposals that followed). The EU is currently busy with preparations for this year’s annual UN climate meeting in Lima, where Arias Cañete will head the European delegation, in coordination with Europe’s foreign affairs representative Federica Mogherini. Cañete plans to publish “in the coming months” a “Communication on our vision for the Paris agreement and nature of the collective global effort required to address climate change in a way that reflect contemporary economic and geopolitical realities”. As far as transport is concerned, (and Energy Post will return to this issue soon), the new Climate and Energy Commissioner may not have to manage the very sensitive file of a potential ban on Canadian oil sands entering Europe. A draft European directive still tabled by the previous Commission no longer singles out oil sands for their higher emissions (as an earlier version once did) and makes the oil industry happy. Member states and MEPs are currently debating the proposal, with a group of Liberal and Green MEPs set to fight to see it rejected. Meanwhile, discussions in Parliament and Council on a proposal to curb indirect land-use change (ILUC) from biofuels are also being revived with official negotiations between the two institutions due to start next year. Cañete’s energy services are also working on a paper on how to implement a new energy governance system to make sure the EU reaches a 27% renewables target by 2030. The Commission is pushing a regional approach that would see EU countries cooperate more to reap the most from national potentials. On energy efficiency, the Commission will soon “propose priority sectors in which significant energy efficiency gains can be reaped, and ways to address them at EU level”, i.e. “low hanging fruits” where the savings are the most economically efficient. Closing this file is crucial to unlocking several other files, says the Commission: meeting energy and climate goals for 2020 and 2030, European energy security and an Energy Union. The EU internal market for energy is supposed to be complete by the end of 2014. But this will not be the case. There is still much to do on the hardware (infrastructure) and on the software (common market rules). On the first, the EU has announced a plan to inject €647 million into a first set of 34 energy infrastructure projects of high value for its security of supply. The money comes from a new EU fund, the ‘Connecting Europe Facility’, which contains a further €5 billion such projects by 2020. The projects come from a list of 248 key energy infrastructure projects published in October 2013. Carrying the label “projects of common interest” (PCI), they benefit from accelerated permitting procedures and improved regulatory treatment. Together with a first-of-its-kind report on energy costs and subsidies in the EU, the Commission in mid-October published a 350-page report on the implementation of the third energy market liberalisation package. European member states had until 3 March 2011 to implement this package via national law but much still remains to be done today. “Full and correct implementation and application of the Third Energy Package is essential for the successful completion of the Internal Energy Market and has always been a priority for the Commission,” the Commission says in an annex to the report. However, “the full and correct implementation of the Third Energy Package rules in the EU will mainly depend on the willingness of the Member States to comply,” it acknowledges. The Commission issued guidance to help member states apply the EU law, but this provide insufficient. It therefore initiated a new procedure called “EU Pilots” to avoid, as far as possible, lengthy referrals to the EU Court of Justice, and give preference instead to clarifying and discussing potential problems directly with national authorities. At present, nine such EU Pilot cases on ad-hoc issues are on-going, but they could result in further infringement procedures. They concern a variety of issues such as tariff rules, potential export and import restrictions, independence requirements for the national regulator, etc. The biggest failure of the internal energy market so far is for consumers, who seem not to have reaped its benefits – although the Commission estimates net economic benefits from completion of the internal market to be in the range of €16-40 billion per year. Yet the situation is that wholesale electricity prices have dropped while retail prices have surged. Common infrastructure use rules (network codes) for gas have been finalised. For electricity, “we are on track for the adoption of the first set of codes later this year,” the Commission says. But further ones will take up to two years to develop, delaying the process. Furthermore, the Commission sees blossoming national capacity markets as “the threat of uncoordinated and counter-effective national measures damaging the internal market” and is struggling to make them compatible with the very idea of an internal market. “I wish we did not need them, but we do,” lamented Klaus-Dieter Borchardt, Director for the internal energy market at DG ENER, Commission, during a conference in Brussels on 19 November. (See our article on approval of the UK capacity market here.) Others say the Commission is hardly helping its own case with decisions such as approval of UK government subsidies for new nuclear power at Hinkley Point C flying in the face of an EU internal market for energy. In any case, a 2012 Commission action plan to complete the internal energy market is still valid today, with its list of 22 actions not yet exhausted. It will be one of the top priorities of the forthcoming Latvian rotating presidency of the EU starting next January.